If you’re having people over and want to serve Southwest-inspired finger food, look no further than flautas. 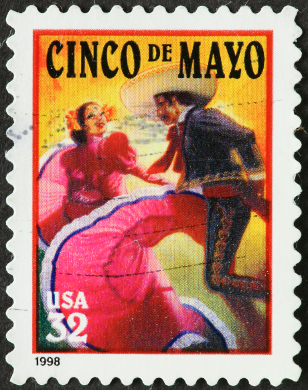 The word “flauta” (flaow-tah) means “flute” in Spanish, an allusion to the rolled shape of the tortillas in this dish. Here we’ve provided two styles of flauta: blue corn beef, and chicken flautas with tomatillo/avocado sauce. 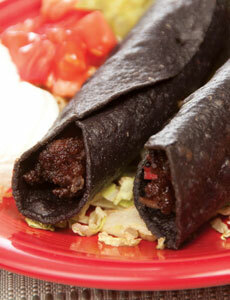 No, these aren’t burned flautas…they’re made with blue corn tortillas! This recipe comes from Dave DeWitt’s book, The Southwest Table. Brown the beef in a skillet and drain the excess fat. Add the chiles, bell peppers, onions, salt, cumin, and cook until the onions and bell peppers are soft. In another skillet, fry the tortillas in the oil for a few seconds until soft. Remove and drain on paper towels. Place the beef mixture in the center of the tortillas, roll up the tortillas, and secure with toothpicks. Fry the flautas in oil until crisp. Set the flautas out in a pan, and let your guests top with the lettuce salsa, cheese, guacamole, and tomatoes. This recipe comes from the Fiery Foods & BBQ Supersite. Place all the ingredients in a blender or food processor and puree until smooth. 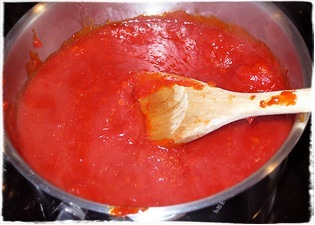 Allow the sauce to sit at room temperature for an hour to blend the flavors. In a heavy skillet, heat the oil and saute the onion and garlic until soft. Remove from the heat and toss with the chicken and cilantro. Pour the oil to a depth of a couple inches and heat to 375 degrees F. Dip the tortillas, one at a time, in the oil for 5 seconds to soften. Remove and drain on paper towels. Place some of the filling on each tortilla, sprinkle with cheese, roll as tightly as possible and secure with toothpicks. Fry the flautas, 2 or 3 at a time, until crisp and browned, about 1 minute. Drain and remove the toothpicks. To serve, arrange the flautas on a platter, drizzle some of the avocado sauce over the top and serve the remaining on the side for dipping. Lois is the Editorial Director of the Burn! Blog and the Fiery Foods & BBQ SuperSite.